Surface Design Association is proud to present our winter 2017 edition of the Journal: “Future Fabrication: SDA International Exhibition In Print!” After receiving over 250 entries, jurors Kathryn Hall and Richard Elliot (also Guest Editor) curated a selection of 34 artists from 17 states, as well as Norway, Hungary and British Columbia, Canada, 7 of which are award winners. The artists featured in “Future Fabrication” created works that are strong, distinctive, thoughtful, and carefully constructed. 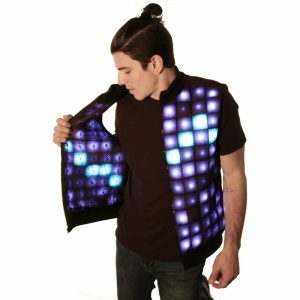 Rachel Merrill and Devon Merrill are a mother-and-son design team, whose work combines an array of textile techniques with embedded electronics to create technology-inspired fashion. Rachel Merrill and Devon Merrill Wearlight 2016, cotton, polyester, electronics, 30” x 20”. Photo: Devon Merrill. Aaron Fein’s politically-charged work deploys digital and machine embroidery to comment on the polarizing views on technology, religion, and symbolism within American society. 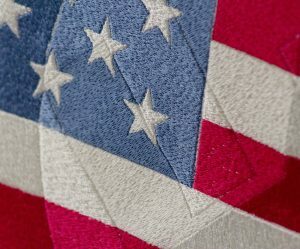 Aaron Fein Worry Flag: War & Peace (detail) 2017, rayon thread, linen, bamboo embroidery hoop, machine embroidered, 54” x 18”. Yekaterina Mokeyeva has a deep love for nettles and is interested in how they can be processed, combined, and pushed to their limits to see what is possible when it comes to materiality and tradition. 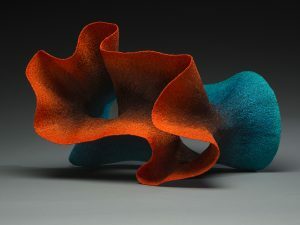 Yekaterina Mokeyeva Stinging Waves 2017, fiber derived from nettles, merino wool, wet sculptural felting, 50” x 25” x 10”. Photo: Sergey Mokeyev. Model: Anne Goodling. 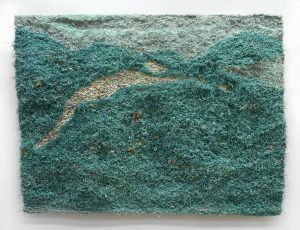 Mary Babcock utilizes immense amounts of fishing nets to create works that map natural locations humans have altered far beyond repair, acting as a witness to the complexity of both internal and external worlds. Mary Babcock 1° 55’ 30” N (Self Portrait as Atoll) 2017, salvaged fishing nets and lines collected across the Pacific, terrestrial, celestial, and aquatic maps, deep sea fishing line, handwoven, 68” x 96” x 3”. Photo: Christopher Rohrer. 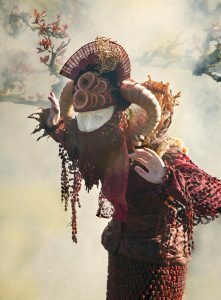 Nicole Dextras creates elaborate garments and spaces from natural materials (fruits, mushrooms, thorns, tree bark, fish mah, and more) that center around the storyline of a young woman named Persephone who lives in a dystopian future where fast fashion is dead and organic materials reign supreme. Nicole Dextras Waiting for Spring (video still) 2016, featuring Pomegranate Ensemble and Pomegranate Respirator Mask. Jayoung Yoon’s work draws upon the mind-matter phenomenon, exploring our thought systems, perception, and body sensations to create performances, videos, and sculptures made from human hair, resin, and the body. Jayoung Yoon Listening to the Mind I (video still) 2009, human hair, resin, hand knotting, approximately 8′. Mali Winfield Mrozinski focuses on the body as a place for conceptual investigation. Her humorous, yet serious work reflects her own habits and neuroses–drawing from personal quirks–to create a new utility for designed objects. 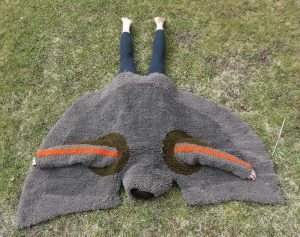 Mali Winfield Mrozinski Carpet Jacket (a tool to feel grounded) 2016, machine and hand tufted wool, 72” x 60”. 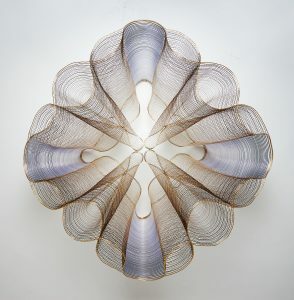 Anastasia Azure Neutral Zenith 2017, dyed fishing line, brass wire, plastic filament, 36” x 36” x 15”. Photo: Graystone Studios. 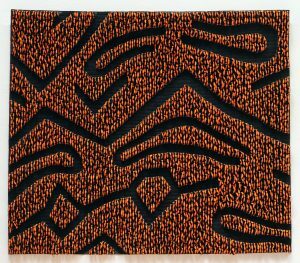 Naomi Velasquez Masque 2016, cotton batting, commercial cotton fabric, cotton thread, adhesive, matte medium, fabric paint, hand-dyed, machine-quilted, construction, 34½” x 40″ x 3″. Photo by the artist. Claire B Jones Triportal 2017, cotton canvas, thread, free-motion embroidery, 19″ x 12″ x 11″. Photo: Bret Corrington. 9) In Review: “Making Our Mark: SDA at 40” by Alison Gates looks back at SDA’s 40th Anniversary Conference in Portland, Oregon. The article reflects on the keynotes, breakout sessions, and exhibitions that the conference had to offer. 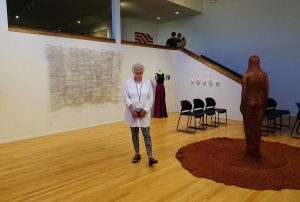 Jane Sauer in the Crossing Generations exhibition at the Hoffman Gallery, Oregon College of Art and Craft. Photo: Astrid Bennett. 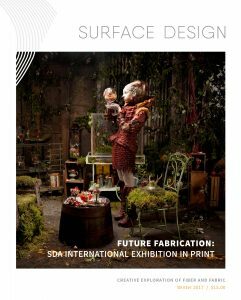 To buy a copy of “Future Fabrication: SDA International Exhibition In Print”, go to the SDA Marketplace, or you can check out a free digital sample on our SDA Journal page.